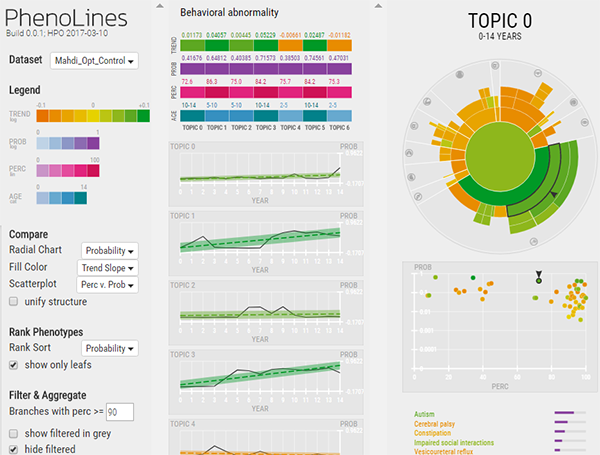 PhenoLines is a visual analysis tool for the interpretation of disease subtypes, derived from the application of topic models to clinical data. Topic models enable one to mine cross-sectional patient comorbidity data (e.g., electronic health records) and construct disease subtypes—each with its own temporally evolving prevalence and co-occurrence of phenotypes—without requiring aligned longitudinal phenotype data for all patients. However, the dimensionality of topic models makes interpretation challenging, and de facto analyses provide little intuition regarding phenotype relevance or phenotype interrelationships. PhenoLines enables one to compare phenotype prevalence within and across disease subtype topics, thus supporting subtype characterization, a task that involves identifying a proposed subtype’s dominant phenotypes, ages of effect, and clinical validity. We contribute a data transformation workflow that employs the Human Phenotype Ontology to hierarchically organize phenotypes and aggregate the evolving probabilities produced by topic models. We introduce a novel measure of phenotype relevance that can be used to simplify the resulting topology. The design of PhenoLines was motivated by formative interviews with machine learning and clinical experts. We describe the collaborative design process, distill high-level tasks, and report on initial evaluations with machine learning experts and a medical domain expert. These results suggest that PhenoLines demonstrates promising approaches to support the characterization and optimization of topic models.